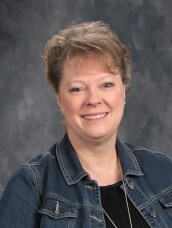 Mrs. Morrison is the Fine Arts teacher at Calvary Lutheran School. She grew up in rural Illinois in a small farming community. She currently teaches 3rd-8th Art and K-8 Music. She is a graduate of Concordia University, Chicago, with a degree in Elementary Education and a major in Art. She feels blessed to be teaching at a school where she can freely share Christ and her faith with students everyday through the Arts. She met her husband, Dennie, during her first year of teaching in Illinois. (1985) They have one daughter, Annika, who loves to play volleyball. The three of them enjoy traveling, exploring, and camping with their two dogs, Joy and Eli. When she is not on the go, she can be found spending time with family and friends, searching Pinterest, painting, doing home projects, or reading.